I’d never been to the Centro Capital Centre Hotel before, even though it is close to the end of town that I live at. But I popped along for lunch recently to take a peek and here’s what I found… Good food at great prices and some great happy hour deals! So, obviously the hotel is very close to ADNEC, making it perfect for out of towners to stay at when attending conferences, but it’s also just literally right across the road so it’d also be a great place to pop over to for lunch or for a break when attending a conference or exhibition to get away from the hustle and bustle for a breather. 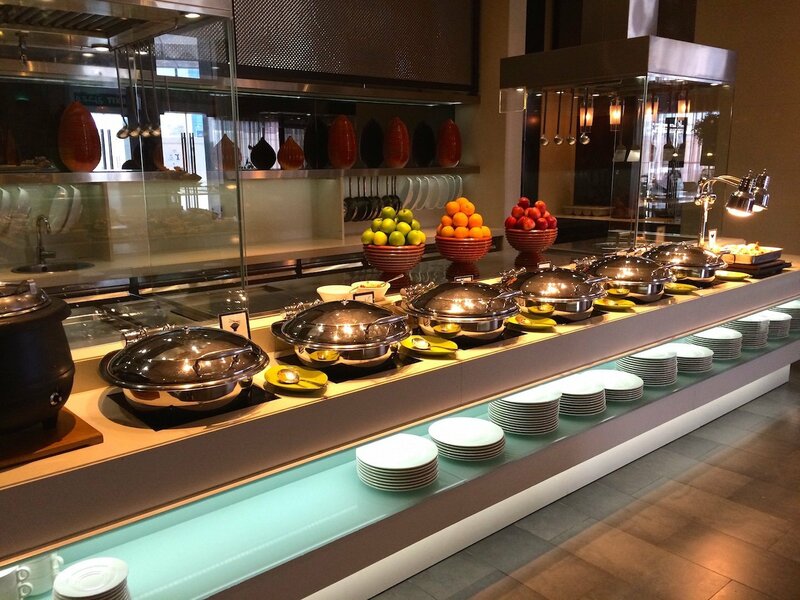 I had lunch in the C.Taste buffet restaurant which is priced at a rather bargainacious Dhs105 per person, for lunch or dinner! 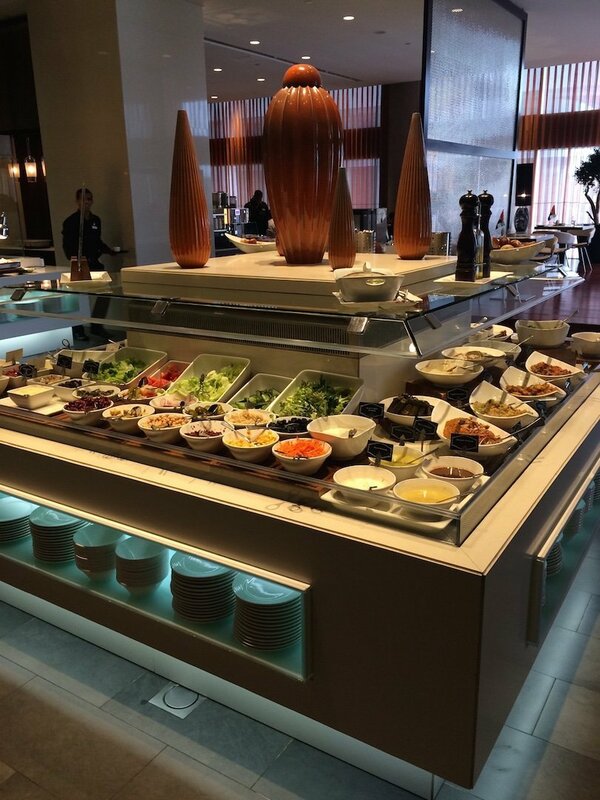 I started off with the salads as they have a rather impressive salad bar. All lovely and fresh and I found there was a lot of choice – both of ready mixed salads, but also of bits and pieces to build your own just the way you like it. So that’s what I decided to do – and as you can see from my picture below, my plate is not the prettiest by any means, but it did taste good! 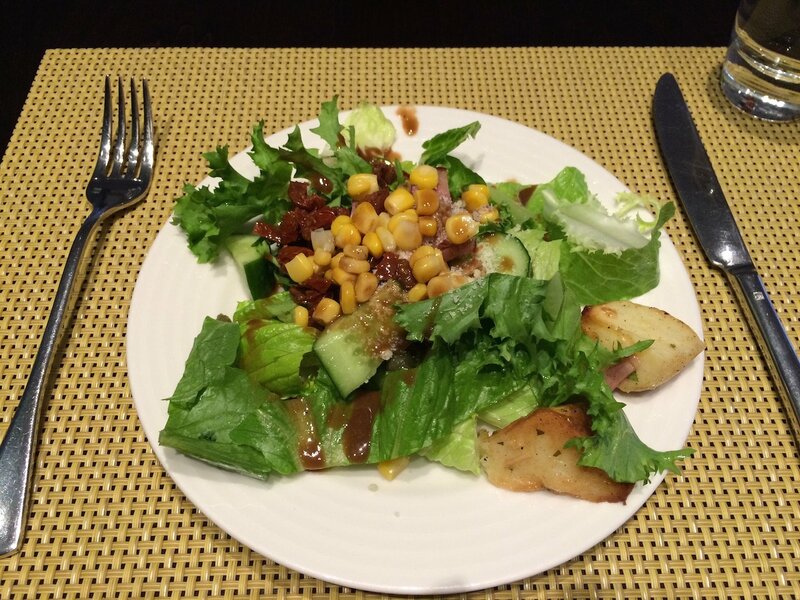 I went for sweetcorn, an assortment of lettuce, sun-dried tomatoes, dill pickles, cucumber and a little potato salad all topped off with a thick, rich balsamic dressing. Yum. 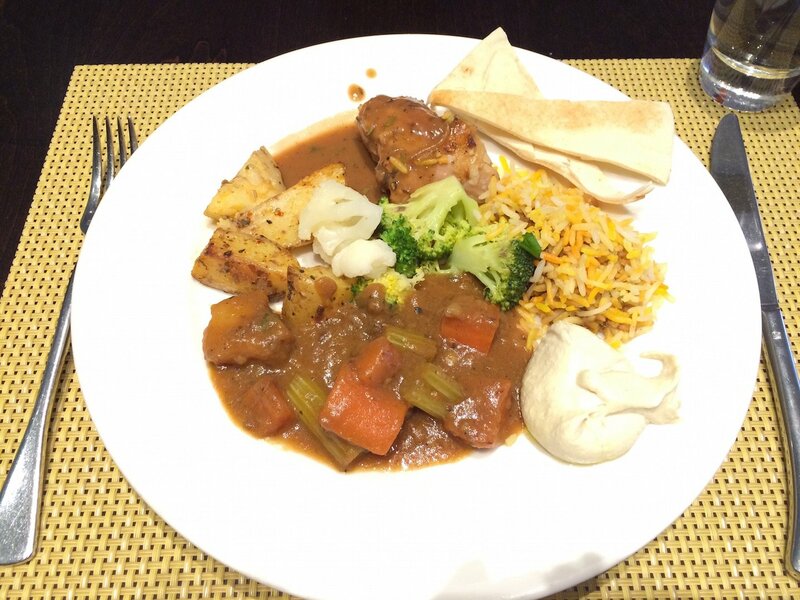 I went for some lamb biryani which was very tasty and not too heavily spiced at all as I sometimes find here in the UAE – people like their food on the spicy side so these dishes are often too much for me but not so on this occasion! I also tried the beef stew, roast chicken, roast potatoes and steamed veggies (with a random bit of hummus on the side that I just fancied!). It was all lovely but I think my favourite was the beef stew which was very flavourful and had a definite mums’ homemade cooking feel about it. 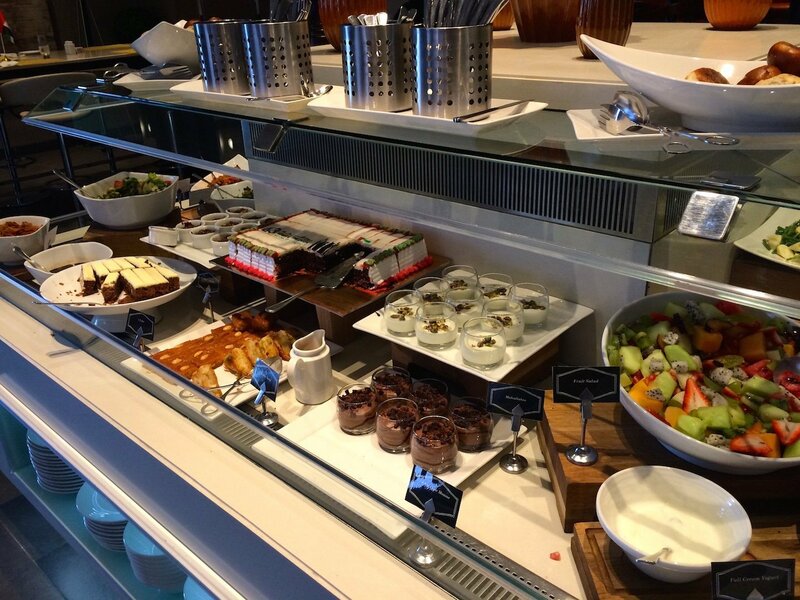 Of course no buffet is complete without a decent dessert station – and since my visit was just before National Day, they even had a fabulous National Day chocolate cake as their centrepiece! Very seasonal – and very tasty too I might add. 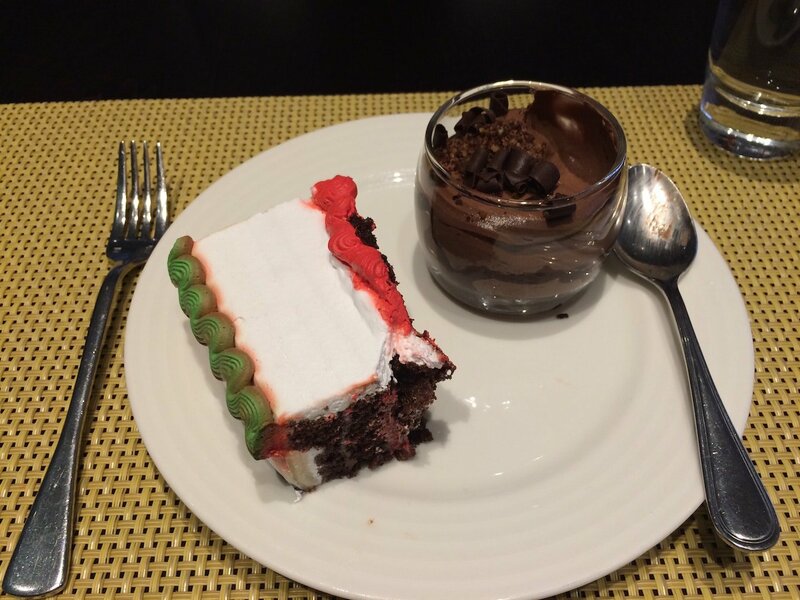 I went for ‘just’ the National Day choccy cake and my other favourite dessert – a chocolate mousse. I love a good chocolate mousse and this is one I’d go back for – rich, thick and smooth, just the right consistency – it went down a treat! 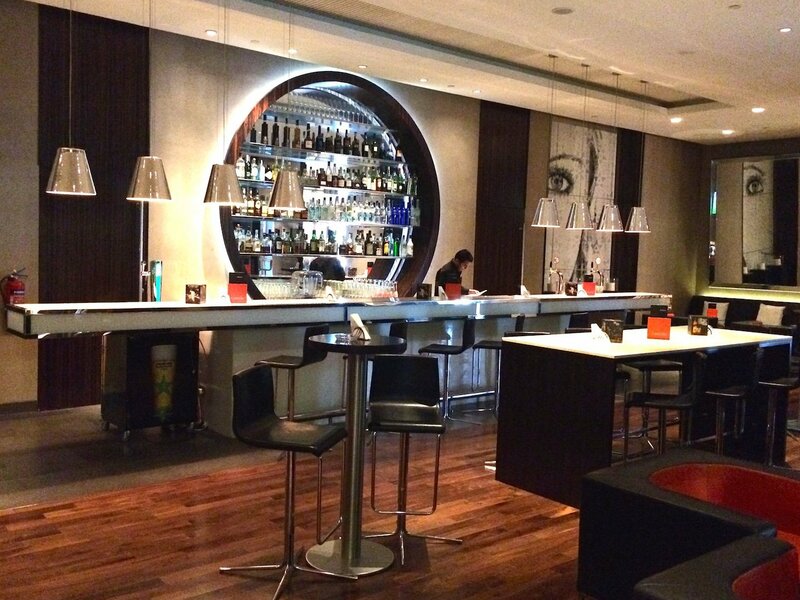 If you live in the area you might like to know that the hotel also has a cocktail bar called C.Mondo where you can pop in for a daily happy hour from 5pm to 8pm with different offers on different days, the best offers being 50% off certain drinks every Monday, Tuesday and Wednesday. If you want to know more about their offers you can click here to find the latest details. And if it’s festive offers you’re after, of course the hotel has a bunch of those going on right now too, again all at bargain prices. If you’re interested in finding out more about those offers. The hotel also has a sister Centro Hotel – Centro Al Manhal in the city, near Al Wanda Mall. I’ve not been to check that one out yet but one point to note if you’re working around that way and looking for a post work wind down bevvy, or are passing on your way out in the evening is that they also have a C Mondo cocktail bar where from 6pm to 9pm every day you can get unlimited cocktails for just Dhs97 per person! And the even better news is, the more friends you go with, the cheaper the package gets! For two people unlimited cocktails cost Dhs189, and for four people it’ll cost you Dhs379! Find the details on that by clicking here. And that’s it for now, do let me know if you do pop down there for dinner or drinks and let me know what you thought too!